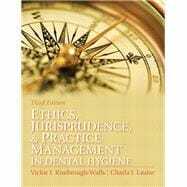 by Kimbrough-Walls, Vickie; Lautar, Charla, RDH, Ph.D.
ETHICS, JURISPRUDENCE AND PRACTICE MANAGEMENT IN DENTAL HYGIENE, 3/eis the definitive, up-to-date guide to ethics, jurisprudence, and practice management for all dental hygiene students, new graduates, and licensed practitioners. The authors first introduce codes of ethics; discuss how ethical principles and moral values influence society, individual, and the profession; and cover crucial ethics-related topics such as informed consent. Next, they turn to practice management, showing how the dental practice must operate as a small business, and offering thorough career coverage. This edition#x19;s extensive updates include: dental therapists and other alternative workforce models; regulatory changes; opportunities in forensics; comparisons with practice in Canada; and much more. Extensive new resources are provided on the MyHealthProfessionsKit website.